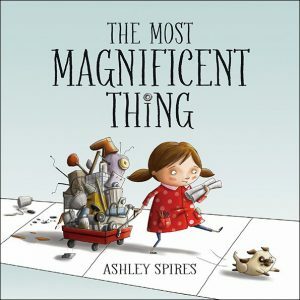 As a picture book lover of the genus hoarder, I advocate for classroom read alouds by finding curricular tie-ins to make reading authentic children’s literature an everyday part of the Montessori experience; but, honestly, some picture books are so fantastic (or in this case, magnificent), they secure their place in the classroom, no strings attached. They just deserve to be read aloud again and again. . . . period! Such is the case with . 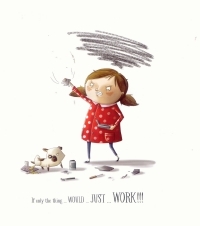 . .
Here’s the story – One day a little girl has a wonderful idea. With the help of her canine assistant, “she is going to make the most MAGNIFICENT thing! She knows just how it will look. She knows just how it will work. All she has to do is make it, and she makes things all the time. Easy-peasy!” But making her magnificent thing is anything but easy, and the girl tries and fails, repeatedly. Eventually, she gets really, really mad. She is so mad, in fact, that she quits. But after her dog convinces her to take a walk, she comes back to her project with renewed enthusiasm and manages to get it just right. This humorous book offers a perfect example of the rewards of perseverance and hard work, and the importance of a growth mindset. There is value in failure, and in this story the failure is continual and incredibly frustrating. The girl’s frustration and anger are vividly depicted in the detailed art, and the story offers good options for dealing honestly with these feelings, while at the same time reassuring children that it’s okay to make mistakes. Montessorians will recognize the parallels this story makes to our own pedagogy. Children are challenged in our multi-age environments, but are given time to practice and practice some more. Effort, not talent, is honored; and mistakes are viewed as opportunities to learn and grow everyday. Read this book aloud . . .
in honor of pronouns – all of THEM – THEY enjoy quite a romp through this book! for the wager of who will be the first to notice the pug’s pee splash – no spoiler alerts . . . wait for it! So, go, gather your children, and read (or re-read) this book! Enjoy it and embrace it for every child who seeks challenge, works hard, makes mistakes, then gives it another go.